What do you get with two Egyptian cousins-in-laws, three authentic Cairo dishes, hibiscus tea, and a white, red and blue food truck? El Qahirah. 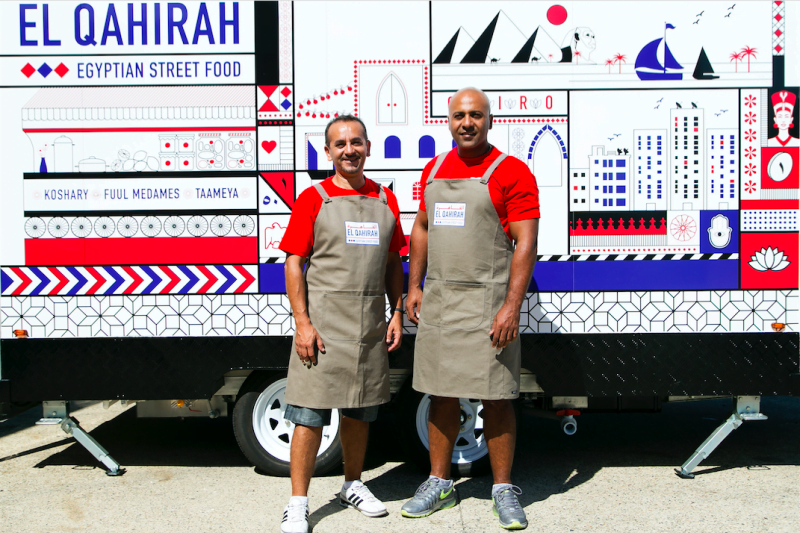 Born from a love of Cairo’s traditional food and street culture, George Kaldas and Ishac Soliman bring you El Qahirah. Thanks to the persistence of family and friends, they have made their dream come true and they’re bringing it to you from a little white, blue and red van. El Qahirah the official Arabic name of Cairo translates as ‘the Conqueror’. That is just what cousins-in-law Soliman and Kaldas are doing. Conquering the world’s food truck fad. Sticking true to their roots, Kaldas and Soliman have resisted puffery and instead have stuck with three wholesome, superfood filled, traditional dishes. 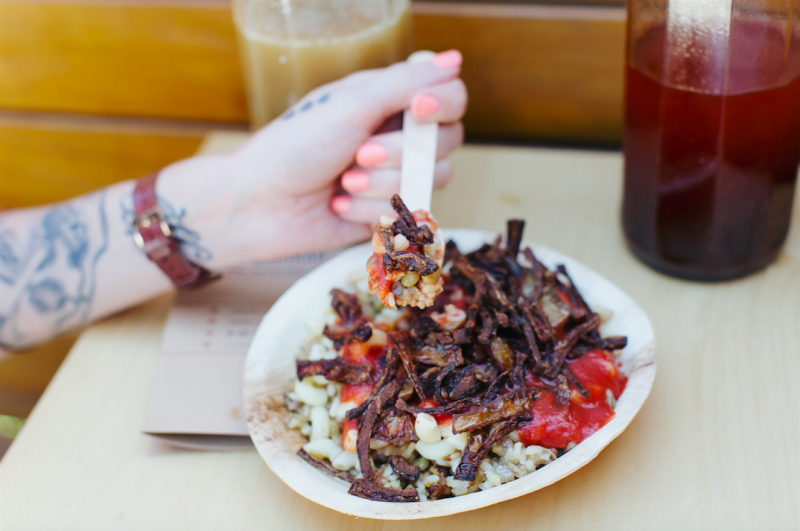 This mound of rice, lentils and macaroni is topped with a glorious mixture of cumin spiced tomato salsa and chickpeas, sprinkled with crispy fried onion. Considered by chef Soliman himself to be the forerunner for Egypt’s national dish, koshary is one dish that belongs exclusively to Egypt. If you want to walk the streets of Cairo and peer into the distant pyramid dusted desert, Koshary will take you there. For all you warriors, how about a breakfast Anhur the Egyptian god of war would approve of? Baladi, a traditional, wholemeal pita bread, is packed full of slow-cooked fava beans, served with pickles, tomato and cucumber. These beans are simmered with olive oil, lemon juice, garlic and spices, providing enough protein, fibre and essential minerals to help you battle through the day. From the days when pharaohs reigned over 3000 years ago, this Egyptian staple is packed full of superfoods. With fava beans, fresh shallots, coriander, onion, parsley and garlic, Taameya is a green machine. 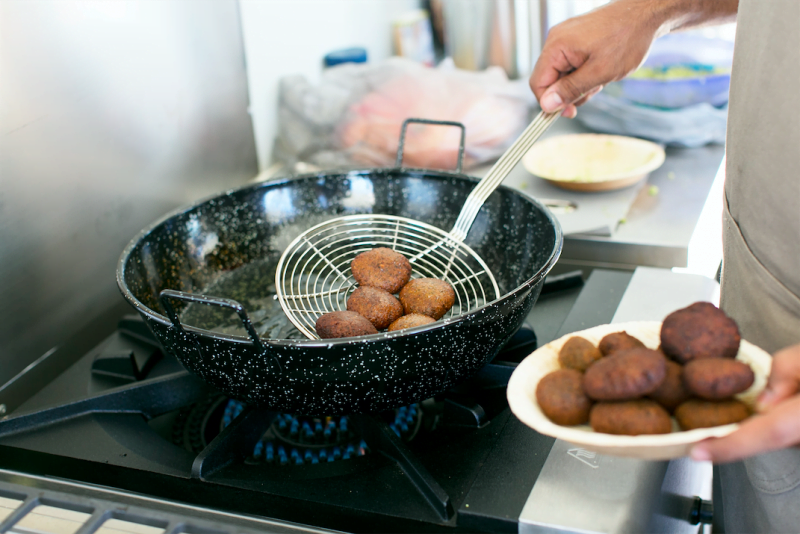 Adding some freshness, these fava bean balls are tossed with fresh tomato and cucumber salad, pickles and radish and served within the traditional baladi bread. Currently in talks about appearing at events and festivals, Kaldas and Soliman are hoping to grow the menu with dishes inspired by seasonal ingredients. 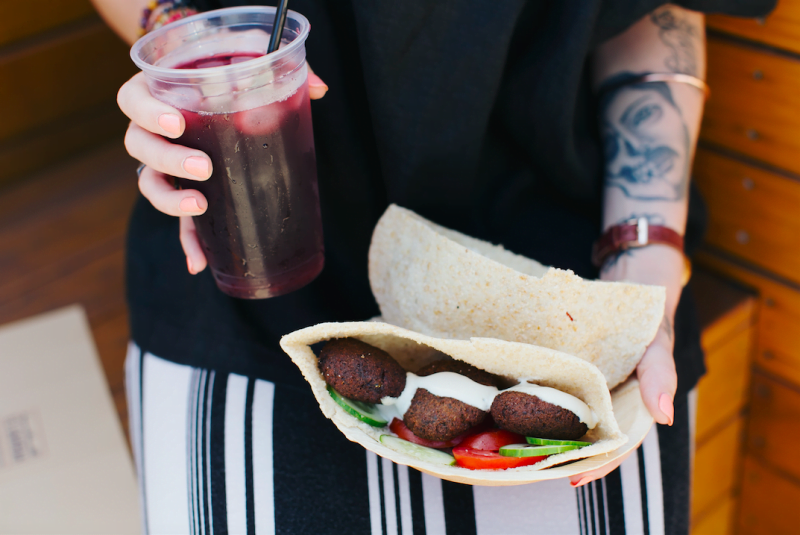 For now, they’ll be travelling around Sydney, offering simple and honest Egyptian food. For your chance to try this cuisine you can find El Qahirah popping up on March 3rd at Marrickville’s Batch Brewing Company. They’ll also be popping into Newtown’s Young Henry’s on 10th of March. Links to follow the journey of El-Qahirah are below. Remember, if you feeling a little parched after all that chasing, be sure to grab yourself a home-made hibiscus tea.